I came to education out of the business world. Before entering the classroom, I was making my way up the corporate ladder at a Fortune 500 company. But then, over 15 years ago, I realized that I wanted a job where “success and advancement” would mean changing more lives, not just earning more money. That’s why I came into teaching, and why I stay. 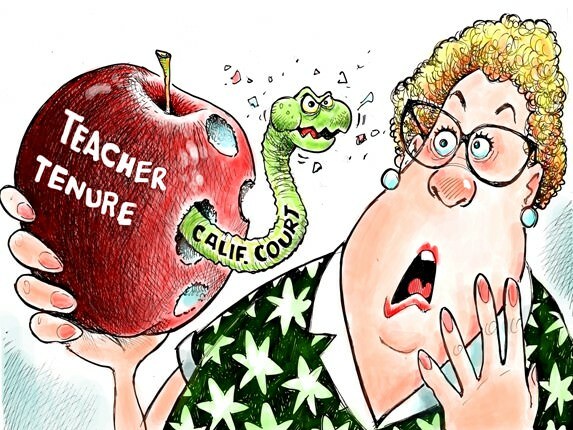 So as someone who deeply loves his job and his students, I am disappointed in the reactionary response of many of my colleagues to the ruling in Vergara v. California, in which California’s teacher tenure laws were ruled unconstitutional. Rather than an attack on teachers, Vergara has given us an opportunity to completely rethink the systems of teacher tenure, support, evaluations and lay-offs. When I received tenure, it was the result of an arbitrary and opaque process, divorced from my work in the classroom helping students. At the moment, tenure remains the only official milestone for most teachers’ careers. So rather than an empty stamp, we want tenure to be meaningful, impactful, and part of a career-long system of professional development. This ruling presents a rare opportunity for actual classroom educators to own our profession and lead the nation in creating an innovative, student-focused and teacher-driven system for how we hire, evaluate and retain educators. The impending wave of retirements and decline in new teacher credentials being issued means we have to do something new to ensure that we are not facing understaffed classrooms in the coming years. Changing tenure is not the silver bullet, but it can be a key part of the solution. We need tenure to reflect the complex and growth-oriented nature of teaching itself. Teachers base their evaluations of their students on multiple factors. In the same way, we must reimagine tenure as something equally multi-faceted and dynamic. A system like this would require ongoing professional development and teacher training, so students can have access to educators who are on the cutting edge of the profession. Securing and maintaining tenure in higher education requires ongoing research and scholarship. Similarly, tenure in K-12 should reflect ongoing growth in pedagogical and content knowledge, and impact on students. Updated tenure and lay-off practices should not exclude seniority as a factor. After all, we must recognize the work, commitment and experience of our best and seasoned teachers. But it must also be based upon student data, community and parent engagement, leadership roles, and pro-student accountability measures. This, coupled with the ongoing professional development, is how we can make tenure a truly meaningful professional milestone for teachers. If our most talented and dedicated teachers are the architects redesigning tenure, it can be a signifier of educators most committed to serving their students. As an active member of my teachers union, United Teachers Los Angeles (UTLA), and the child of a father who was a member of a union, I believe we absolutely do need our union to protect us from unfair labor practices, bias or discrimination. But I do not pay dues to protect ineffective teachers or to pass by incredible opportunities to elevate our profession. We need the union to lead, making sure that new programs help students, comply with the law and maintain adequate protections for good teachers. When Superintendent John Deasy goes to the legislature and asks lawmakers to come up with a new plan, UTLA leadership should be there, representing the interests of its best teachers, who care deeply about the rights of their students. If our teachers union does not seize this opportunity, there are plenty of other special interest groups that will. With a new board set to take over UTLA this year, I hope our union begins to focus on the future, instead of fighting for the past. Fixing tenure practices to conform to the Vergara ruling will elevate the teaching profession, changing its reputation and attracting the best and brightest. New structures would reaffirm what all teachers know – teaching is complex, difficult, and reserved only for those willing to work hard. We cannot allow this opportunity to pass us by. I sincerely hope that when the dust settles, we will have a new model for the teaching profession that makes tenure the meaningful milestone it can and must be. Ron Taw is a teacher and Instructional coach for mathematics at Los Angeles Academy Middle School in south Los Angeles. He has been teaching for 13 years and has served as department chair and data lead.